So, who will it be in the quarter-finals Hammers fans? Find out in the draw on BBC Two at 18:00 GMT. You can also keep across it here after the Chelsea v Man City game has finished, Gary Rose is talking you through that. Tottenham v Crystal Palace is also happening, they're in the final 20 minutes there and Caroline Chapman has coverage right here. But, from us here, that's all today. Payet as good as Modric? Real Madrid and former Tottenham midfielder Luka Modric is some player. And Slaven Bilic has just made some claim. He tells Match of the Day: "I didn't see better players than that. He is also doing the dirty work. On the ball he is there with Luka Modric from the players I have trained so far. Dimitri is one of the best I have trained." West Ham boss Slaven Bilic speaking to Match of the Day: "We played some fantastic football. We were solid passing the ball and the only way to kill them is to penetrate when we had a situation. We were able to keep the ball and get the ball in behind the spaces. It looked easier than we thought but it was us who made it easier." More from Paul Lambert: "I thought for 55 mins we were very good and well in the game. Their first goal I thought Jason Steele should save. The sending off kills us. It opens the game up. It’s hard enough against 11 let alone 10." Blackburn boss Paul Lambert speaking to Match of the Day about West Ham's chances of winning the FA Cup: "I think they can do it. Absolutely. They’ve got momentum at the minute and you wouldn't put it past them." West Ham's name on the cup? 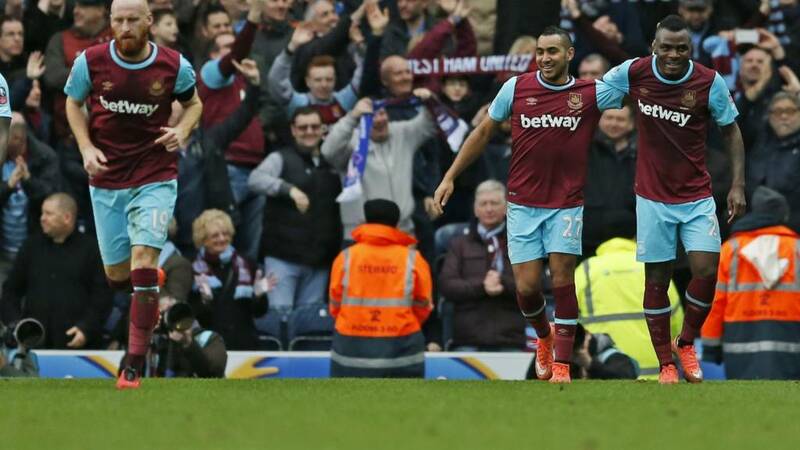 "The other teams involved think like that as well," West Ham's Mark Noble tells BT Sport. "We have players to come in, like Andy Carroll and Diafra Sakho. You also see the options we had off the bench today. It was a tough first 25 minutes. But when we got hold of he game we, got back in it with a couple of bits of magic." "Blackburn were taken apart in the end and West Ham were the better team but the sending off has changed the course of the game. But it does show the gap in class between a good Premier League team and a struggling Championship team." Is Payet any good in training? "He's rubbish," jokes West Ham skipper Mark Noble when asked about Dimitri Payet in training. Hazel Martin: What a performance by West Ham! And love Payets smile at the end. Use the hashtag #bbcfacup, text us using 81111 (UK only) or get involved on the BBC Sport Facebook page. Dimitri Payet made six 'key passes' in that game - passes which were of attacking importance. Nobody else on the pitch made more than two. "I'm just delighted to witness Dimitri Payet. His display and brilliance is absolutely great. He runs quicker with the ball than without it and he seems to glide over the turf." "West Ham are so physically strong as well as everything else they have got, they could make the top five." The camera lingers on the man of the day, Dimitri Payet, who is straight over to the traveling supporters to celebrate the full-time whistle. He's released his shirt into the crowd. I better not see that pop up on eBay later. I mean, how good is this man at football? There are a pile of Blackburn players lying in the wake of the trail just blazed by Dimitri Payet. He jinks and jives his way into the Rovers area and then turns to completely bamboozle Darragh Lenihan before arcing a shot past Jason Steele. He thought he had the hat-trick. But the lino has other ideas. Emmanuel Emenike latches on to a rebound, but he's offside. Unlucky, sir. He's enjoying quite an afternoon - and here's how Emmanuel Emenike made it 3-1 to West Ham a little earlier. We'll bring you his second goal shortly. "When Paul Lambert and Alan Irvine look as this game they will think about that sending off which was needless and it has changed the whole game. I'm not saying Blackburn were ever going to win but West Ham wouldn't have won so comfortably." Could have been a hat-trick for Emmanuel Emenike on his first start. Dimitri Payet finds him in the area again and he drags the ball back, sending Adam Henley on his backside, before clipping his shot against the post. "You know you are struggling when James Collins passes you. It's a bit like running a marathon and a gorilla overtakes you." We told you it was coming. That man Dimitri Payet drops a ball over the top of the Rovers defence, who stand still with their arms in the air. Emmanuel Emenike is in acres of space and time stands still and the Nigerian rounds the keeper and finishes.